A few days ago, my colleague Mariano published a blog post on the Developer Zone describing how to run a MATLAB Test suite on a Continuous Integration server every time changes are pushed to a Git repository branch. 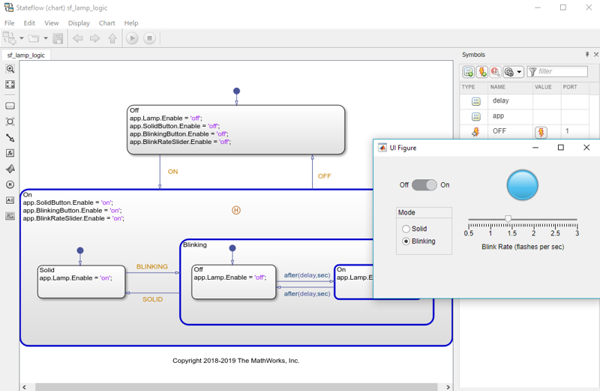 As you probably guessed, as soon as I saw that, I had to implement it in a Simulink context. Let's see how that went. 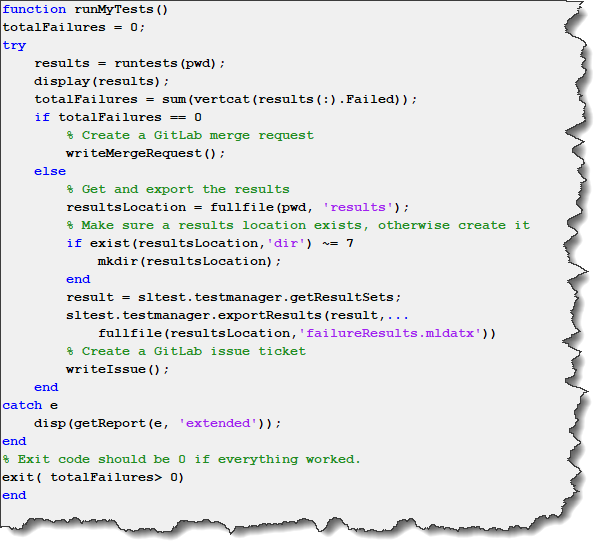 If the test passes, the Jenkins server creates a merge request in GitLab. If a test fails, the Simulink Test results are saved and a bug issue in GitLab is created. This last step of saving the Simulink Test session is very important. As you will see below, it allows me to analyze the simulation results locally without re-running the failed test, saving me a lot of time if the simulation I am testing takes a long time to simulate. Now it's time to go into the details. The post Simulation Based Testing with Simulink Test Manager describes in detail how to set up the test, so I will not repeat it here. What I added for this blog is to create a Simulink Project, adding all the files to it and configure the source control integration. 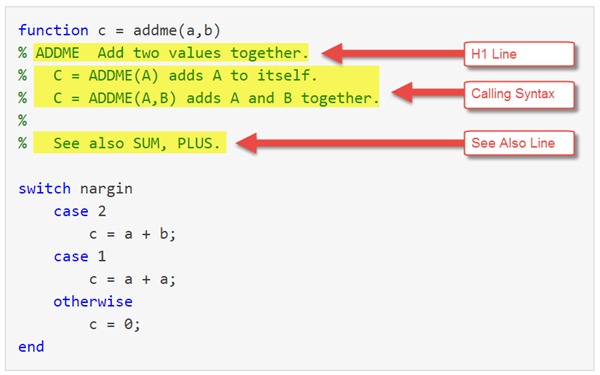 The tests are run through the MATLAB Testing Framework. 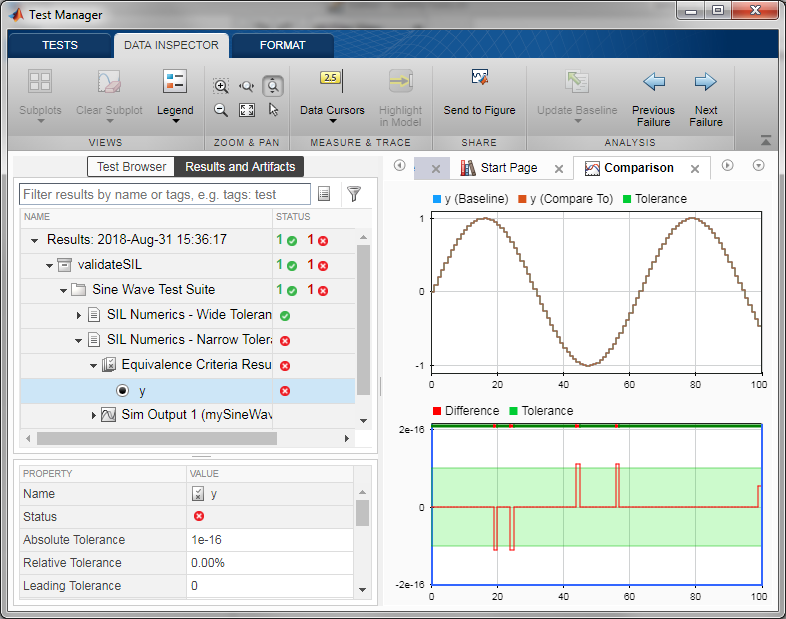 Thanks to that, my test suite can include tests created using Simulink Test and using the MATLAB Testing Framework. As they say where I come from: A test is a test! The functions writeMergeRequest() and writeIssue() contain code similar to Mariano's post, using webwrite to create a merge request or an issue in GitLab using its API. sltest.testmanager.exportResults is used to save the test results in case of a failure. Depending on how your Jenkins server is configured, you could write MATLAB code to put the test results at any place convenient for you. By default, I can go grab my results file in the Jenkins workspace. Once I get the results file, I can simply double-click on it in MATLAB and the Test Manager will show what went wrong. I will repeat it... since I often deal with simulations that take hours to run, getting the results file from the server saves me a lot of time since I do not need to re-run the simulation on my machine. Are you incorporating change management and continuous integration tools like Git and Jenkins in your team-based Model-Based Design projects? If yes, tell us more about your setup in the comments below. This is really interest. I am using Gitlab with Simulink Project but haven't implemented yet any CI system. I know that Jenkins is very popular, however it is not supported by Core (free) version of Gitlab so a different Gitlab license (Starter, Premium or Ultimate) must be purchased. It would be very useful if you could provide instruction on how to setup the Gitlab built in CI tool, that is provided for free also with Core license, for the ones that would like to evaluate CI with Simulink before buying a new product. @Giacomo: I cannot really comment on the GitLab licensing. However I can say that the workflow in this blog post and the one referenced on Developer Zone work on the Core (free) version of GitLab. We are not using the CI feature of GitLab, but using web hooks to trigger Jenkins and the GitLab API to feedback information. I have not tested the GitLab built-in CI tool, so I cannot comment on how it compares to the workflow in this post. Thanks for your answer, I found the info about licensing on GItlab website and in a forum, but Core version works for you then I will definitely try it. Does anyone have any experience running Matlab/Simulink tests directly from GitLab's CI without Jenkins? Hi Federico. I was eventually able to configure a 100% Gitlab CI (no jenkins) with Matlab/Simulink. I got inspiration from this: https://stackoverflow.com/questions/34647154/gitlab-ci-with-matlab# Do you have any specific issue? I got it working, thanks a lot for the tips!